Characteristics: This is the historical and most representative wine of the estate. It was first produced in 1985 and since then its elegant, ripe fruit and mineral content has interpreted the characteristics of the soil where it is born. 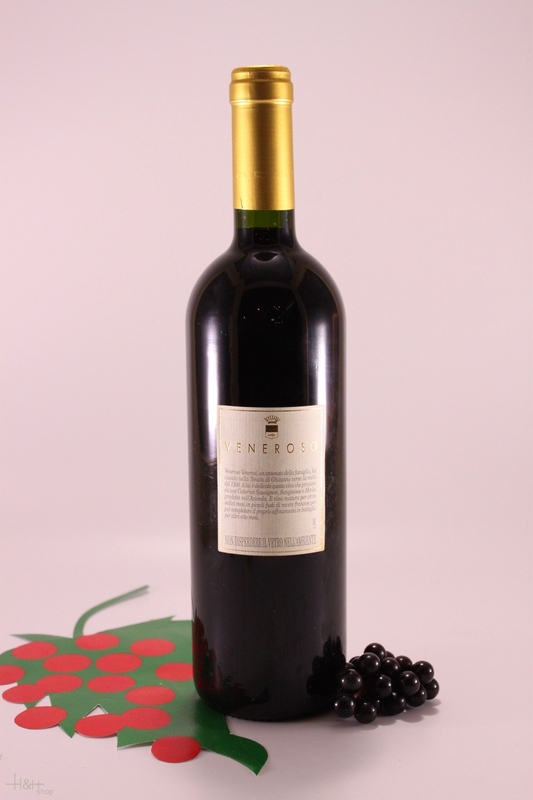 Made mainly Sangiovese with a small percentage of Cabernet Sauvignon, it has become a point of reference for the winegrowing area where it originates. 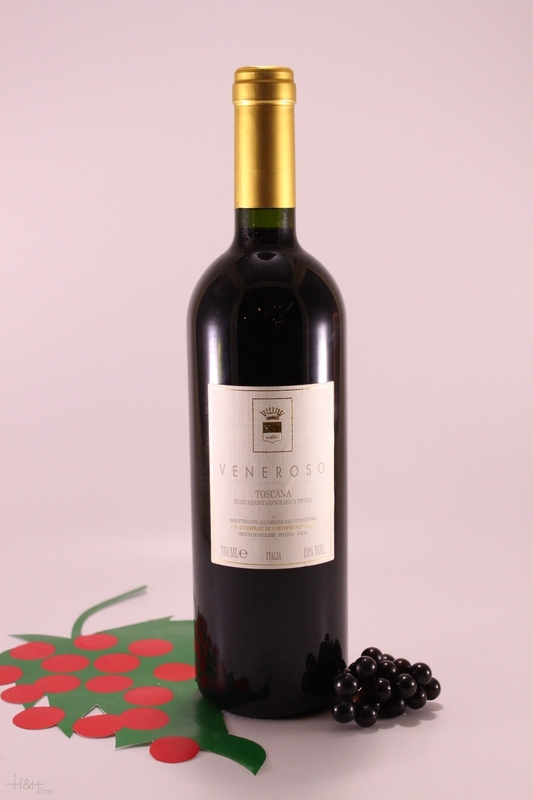 "Doctorwine" has rated the wine "Tenuta di Ghizzano Veneroso Toscana IGT, Tuscany, Italy" from the vintage 2009 on 04.03.2013 with 92 of 100 points.
" The color is a dense ruby with some violet reflections indicating the presence of Cabernet Sauvignon. The aroma has two sides to it, one with fruity scents of raspberry, red plumb and currant, while the other has accents that are almost mineral. The flavor has thick and eager tannins and while the wine is still very young, it is already clear it will age in an amazing way, revealing all its elegance. The finish is long and fruity. Try it with roasted meat, served at 18 degree. " "Wine & Spirits Magazine" has rated the wine "Tenuta di Ghizzano Veneroso Toscana IGT, Tuscany, Italy" from the vintage 2013 on 01.04.2017 with 90 of 100 points. "Decanter World Wine Awards" has rated the wine "Tenuta di Ghizzano Veneroso Toscana IGT, Tuscany, Italy" from the vintage 2013 on 01.01.2017 with 84 of 100 points. "Falstaff Magazin" has rated the wine "Tenuta di Ghizzano Veneroso Toscana IGT, Tuscany, Italy" from the vintage 2013 on 12.10.2016 with 90 of 100 points. "Wine & Spirits Magazine" has rated the wine "Tenuta di Ghizzano Veneroso Toscana IGT, Tuscany, Italy" from the vintage 2011 on 01.04.2016 with 89 of 100 points. "Wine & Spirits Magazine" has rated the wine "Tenuta di Ghizzano Veneroso Toscana IGT, Tuscany, Italy" from the vintage 2010 on 01.04.2015 with 88 of 100 points. "Luca Gardini" has rated the wine "Tenuta di Ghizzano Veneroso Toscana IGT, Tuscany, Italy" from the vintage 2011 on 01.07.2014 with 84 of 100 points. "Wine & Spirits Magazine" has rated the wine "Tenuta di Ghizzano Veneroso Toscana IGT, Tuscany, Italy" from the vintage 2009 on 01.04.2014 with 90 of 100 points. "Wine Spectator" has rated the wine "Tenuta di Ghizzano Veneroso Toscana IGT, Tuscany, Italy" from the vintage 2008 on 31.10.2013 with 92 of 100 points. "Vinous Antonio Galloni" has rated the wine "Tenuta di Ghizzano Veneroso Toscana IGT, Tuscany, Italy" from the vintage 2010 on 01.08.2013 with 93 of 100 points. "Luca Gardini" has rated the wine "Tenuta di Ghizzano Veneroso Toscana IGT, Tuscany, Italy" from the vintage 2010 on 01.07.2013 with 92 of 100 points. "Wine & Spirits Magazine" has rated the wine "Tenuta di Ghizzano Veneroso Toscana IGT, Tuscany, Italy" from the vintage 2008 on 01.04.2013 with 91 of 100 points. "Vinous Antonio Galloni" has rated the wine "Tenuta di Ghizzano Veneroso Toscana IGT, Tuscany, Italy" from the vintage 2009 on 01.09.2012 with 92 of 100 points. "Vinous Antonio Galloni" has rated the wine "Tenuta di Ghizzano Veneroso Toscana IGT, Tuscany, Italy" from the vintage 2008 on 01.08.2011 with 90 of 100 points. "Vinous Antonio Galloni" has rated the wine "Tenuta di Ghizzano Veneroso Toscana IGT, Tuscany, Italy" from the vintage 2005 on 01.09.2010 with 87 of 100 points. "Wine Enthusiast" has rated the wine "Tenuta di Ghizzano Veneroso Toscana IGT, Tuscany, Italy" from the vintage 2004 on 04.01.2008 with 91 of 100 points. "Wine Enthusiast" has rated the wine "Tenuta di Ghizzano Veneroso Toscana IGT, Tuscany, Italy" from the vintage 2003 on 04.01.2008 with 89 of 100 points. "Falstaff Magazin" has rated the wine "Tenuta di Ghizzano Veneroso Toscana IGT, Tuscany, Italy" from the vintage 2004 on 05.09.2007 with 91 of 100 points. "Vinum Wine Magazine" has rated the wine "Tenuta di Ghizzano Veneroso Toscana IGT, Tuscany, Italy" from the vintage 2003 on 01.03.2007 with 16 of 20 points. "Wine Spectator" has rated the wine "Tenuta di Ghizzano Veneroso Toscana IGT, Tuscany, Italy" from the vintage 2003 on 31.10.2006 with 87 of 100 points. "Falstaff Magazin" has rated the wine "Tenuta di Ghizzano Veneroso Toscana IGT, Tuscany, Italy" from the vintage 2003 on 01.09.2006 with 90 of 100 points. "Wine Spectator" has rated the wine "Tenuta di Ghizzano Veneroso Toscana IGT, Tuscany, Italy" from the vintage 2001 on 31.10.2004 with 89 of 100 points. "Wine & Spirits Magazine" has rated the wine "Tenuta di Ghizzano Veneroso Toscana IGT, Tuscany, Italy" from the vintage 2000 on 01.04.2004 with 88 of 100 points. "Wine Spectator" has rated the wine "Tenuta di Ghizzano Veneroso Toscana IGT, Tuscany, Italy" from the vintage 2000 on 15.10.2003 with 87 of 100 points.